This has been one of the best razor clam digging seasons in years. But Washington State Department of Fish & Wifelife giveth and the Washington State Department of Fish and Wildlife taketh away. Today state shellfish managers announced, "Digging will remain closed on ocean beaches for the remainder of the razor clam season because of elevated toxin levels." The result in cancellation of the two openings that were tentatively scheduled to start May 15 and May 22. The culprit is domoic acid, a natural toxin produced by certain types of marine algae. This is bad stuff which can be harmful or even fatal if consumed in sufficient quantities. The Clams absorb the acid in their fat cells and can retain it even after the ocean is free of the stuff. So if you dug any clams and froze, bottled or canned them it is now time to toss those critters in the trash and write it off to bad luck. But there is good news. The phenomenon of domoic acid is nothing unusual. Clams have been going through this cycle forever. 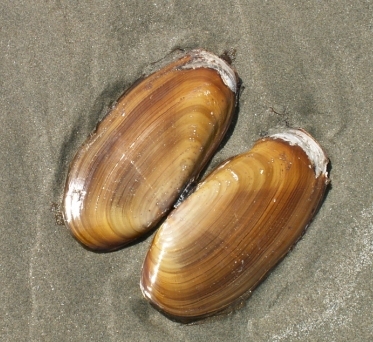 The waters will clear and razor clamming will resume again this autumn. Until then we'll just have it switch over to greasy hamburgers and deep fried fish. Is it no wonder we all love Razors?